KBTalking Blue switch with cross style stem. Similar to Blue Cherry MX in function and feel. coming from a mx red board, good at gaming and awesome at typing. Loud, but thoroughly enjoyable. Nice travel distance, too. 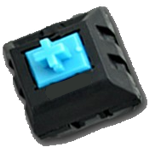 Have experience using KBT Blue switches? Add a review to share your knowledge with the keyboard community.